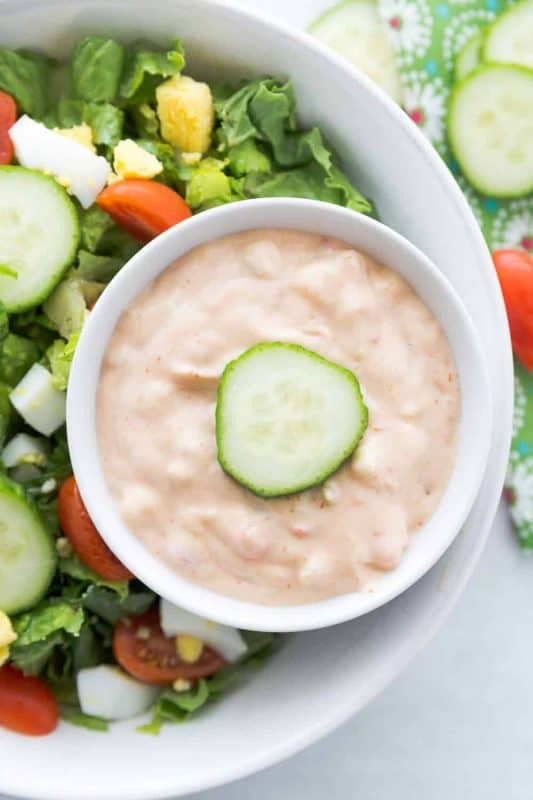 The Best Thousand Island Dressing You’ll Ever Have! In a world of ranch dressing, we are Thousand Island people, but not that bottled madness with it’s sharp taste. We love homemade Thousand Island and I must warn you that tasting this version will officially ruin you for that sharp orange stuff they pass off as Thousand Island on the shelves. This is Thousand Island at it’s freshest, creamiest, most flavorful best. One bite of this and you will be spoiled for life. It’s that good. We actually had to do some fancy footwork to get this recipe. It was originally served at a steak house in my hometown of Huntsville, Alabama. My mother used to love to go there just to get to taste this and they asked for the recipe numerous times to no avail. When she found out one of her friends was dating a waitress at the steak house, she asked him if he could ask for the recipe and here we are. I guess it was the power of love – for Thousand Island Dressing. Alas the steak house is no more so we are thankful that we can still have this gem of a recipe in our lives. We eat this on hamburgers, salads (of course), dip carrots in it, celery sticks, I have been known to just go to the fridge with a spoon from time to time just to taste it! 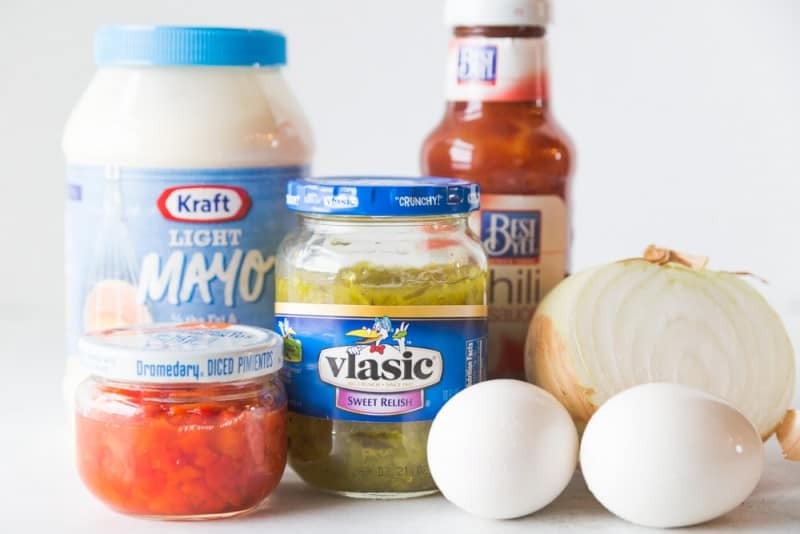 To make this you’ll need: Mayo of your choice*, Pimentos, Sweet Relish, Chili Sauce, Eggs, and Onion. *Make sure you use real mayonnaise, not miracle whip. Cover and refrigerate several hours or overnight to allow flavors to blend before serving. Dive in and enjoy every fresh and delicious bite! 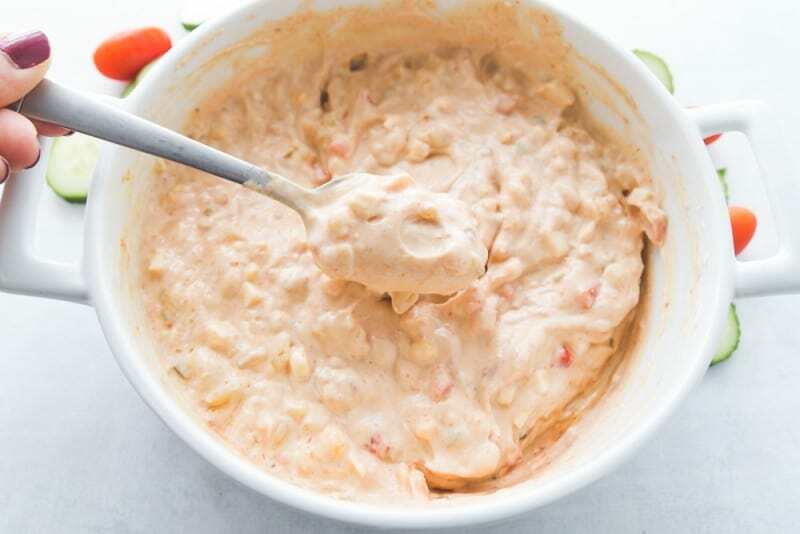 The Best Thousand Island Dressing You'll Ever Have! Place all ingredients in a large bowl and stir until fully blended. Cover and refrigerate for several hours or overnight. If you'd like it a little thinner, you can add a bit of milk. Enjoy! This looks amazing!!! Do you know how long it stays good in the refrigerator? I would try to use it within five days. It’s sooooo good! I have never used “chili sauce”? Is it like a ketchup? Is one brand better than another? Yes it’s like Ketchup as both have a tomato base. But Chili Sauce has other spices. So they are not interchangeable. I like Heinz, but that’s a personal preference. I sure a store brand like Kroger would work just as well. The main thing is thanks compare prices. If there is a lot of difference go with the cheaper one because it’s not like you are going to taste it with all the other ingredients. Now if you are planning on using it on seafood, etc then I would go with my taste preference. Is this from Mr. Steak? Wonderful! Do you have any other Mr. Steak recipes? I loved that place. Ate there many times in the 70’s and early 80’s until they closed. I don’t remember much about the food but you could never forget the Thousand Island dressing. I’ve been looking for this recipe for 30 years! Love it! Legend’s Realty is now on the spot where Mr. Steak was located on South Parkway. How much does it make? Don’t know if I need to double. This looks great, will have to try soon. Thank you Kay!! I hope you get the chance to make it soon!! I was born and raised in Huntsville, which steak house was this? I hope you get the chance to try it soon Fran!!! I can’t wait to hear what you think! 🙂 I am so glad you liked it Fran!!! Christy, I remember having (good) thousand island dressing for the first time back in the 70s at my Sunday School teacher’s house. All of a sudden I did not CARE if I got any meat or baked potato or dessert at that meal – just gimme more salad! Thanks so much for this, it will always be my dressing of choice – unless they only have that bitter, orange stuff. (Same thing with the sour tasting “ranch” on the store shelves). It does make a huge difference!! I hope you get the chance to try mine soon, can’t wait to hear what you think!!! I like Thousand Island dressing on my hamburger to!!! 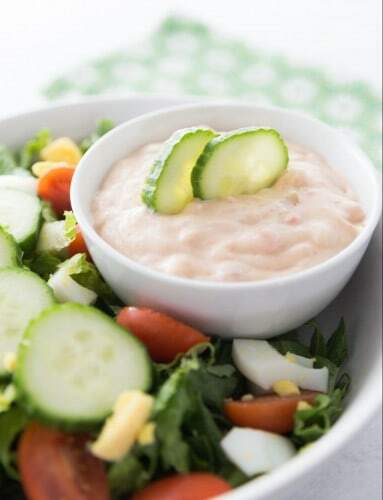 Thousand Island dressing is not just for salads…i love it…i want to make this dressing…YUM. This sounds yummy! I’ll be trying it soon. I made this for MTV family as part of a meal made entirely from your cookbook. It was a big hit! My husband requests it often. I don’t know why spell check changed my to MTV. Ugh. I have been using this recipe since 1969, right after I got married. It really is the best! I was craving steak and the restaurant we went to shared the recipe with me. Thank you so much for this recipe. I absolutely loved the thousand island dressing at Mr. Steak and was devastated when they closed. I have never eaten another dressing to compare and now….I can have it again. Thanks again. Oh I’m so excited! I don’t believe I ever ate there but I remember my parents eating there. Reading this I realize how much I missed out! This dressing sounds sooo good:) I plan on making it this weekend, we love thousand island! Thank You! I have made this for years only I never used pimentos. It is the best for sure. You are the best!!! I have all of your cookbooks but LOVE the individual posts with quotes and directions!!! Christy, what kind of mayo do you use? Living in the south, I am spoiled using Dukes Mayo. Hellmann’s for sure. Dukes would be a distant 2nd. I don’t think there is a 3rd. 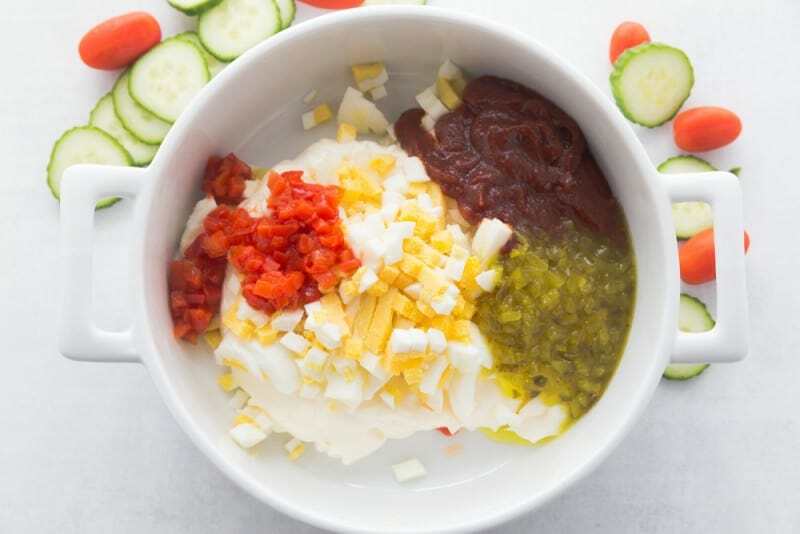 Is it sweet pickle relish or dill pickle relish? If sweet I will use sugar free relish to make it lower carb, even though the chile sauce has 5 carbs per tablespoon. Sad face. No sad faces on Southern Plate, we’re blessed to be here and blessed to have you here with us! 🙂 Yes, it is sweet pickle relish. You can definitely use sugar free. Hope you have a great day! I used 1/4 cup sweet and 1/4 cup dill and it was a big hit. Great recipe. Oh this looks and sounds totally yummy! I can’t wait to give it my shot. Thanks Christy for sharing it. This looks delicious enough to just spread on a piece of light bread for a sandwich or on crackers for a snack. How many eggs did you use in the recipe in the picture? I am on the way to the kitchen to make this yummy Thousand Island Salad Dressing! The BEST! 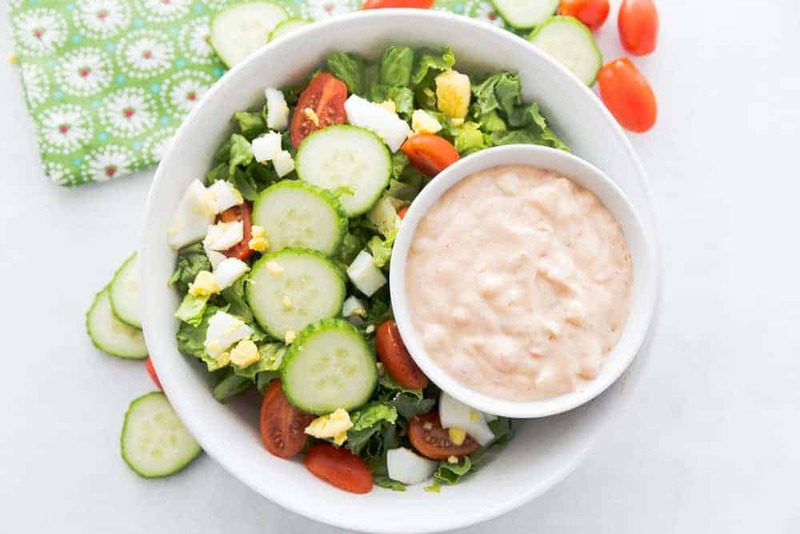 Salad dressing has never been a favorite of mine – could just eat this up…… Will have it on hand at all times for sure. Thanks for the great recipe! I am so glad to hear you liked it!!!! Hi Christy, oh my this really looks good…. I’m not ordinarily a big fan of Thousand Island dressing, I must say this looks so much better! Maybe even on fish? I don’t know but I’m sure going to try it! Btw there was a coupon for milk on it and it would not connect to the website. No biggie but it could’ve saved a bit, you know? Thanks. It is so much better than!! I can’t really say how it would be on fish since we eat very little fish or seafood ( ok, none 🙂 ) in our house but I imagine it would be good!! This is perfect on fish and if you are having seafood I would add a little prepared horseradish to the mixture. We have both at least 2 times a week. We live very close to the Gulf and it is always fresh. I used the 1000 on grilled whole Red Snapper this past weekend. We just got some Dolphin and will give the 1000 a try on that Saturday. Now I’m hungry! Did you really eat a dolphin? That makes me sad. I so understand how this could upset you. But I’m familiar with what she’s referring to. She isn’t talking about a large dolphin / porpoise that is playful with humans and swims alongside boats, aka Flipper. She is talking about a saltwater fish that is also called dolphin. It’s a fish like trout or redfish or flounder, etc. In the stores it is called Mahi Mahi. If they named it dolphin nobody would buy it . ha ha. Completely different fish than ‘Flipper’. First thing that came to mind for me? REUBENS!! can’t wait to check it out on a good ol’ homemade Reuben. WITH THE EGGS IN THIS RECIPE, HOW LONG CAN YOU KEEP IT IN THE REFRIGERATOR. MY HUSBAND IS THE ONLY ONE THAT EATS THOUSAND ISLAND AND I DON’T WANT TO MAKE TOO MUCH AND HAVE IT SPOIL. Christy stated earlier to try to use in less than 5 days. HOPE this helps you. I would try to use it up within about 5 days. Remember Mr. Steak’s “flower pot” bread? So good. Also, do you remember “Boots”? They had good steaks, too. And The Fogcutter! OH how I miss the Fogcutter!!!!!!!! We don’t have any little private steakhouses like that anymore that you know of, do we? I know we have some high falootin’ restaurants downtown but that’s just not my speed. Christy, I just told my hubby Monday night that I was going to try and find a good recipe for Thousand Island dressing. I think I found it. Going to make it tomorrow. Thank you so much for passing this along. I hope you like it Diane!! Let me know what you think!! I cannot believe you have this recipe! I can’t wait to try it, Mr Steak used to be my favorite place to eat for 3 things – #1 this salad dressing, best I have ever had to this day, #2 – their rolls was awesome! and #3 their sweet tea with a orange slice – not lemon. I still miss it. Give me these 3 things and I could care less if I had a steak or not. I made this this week. It is amazing!! I am so glad you liked it Carolyn!!! Wow. Wow. Wow! It IS the best. I am so glad you liked it Becky!!! This looks delish, will have to try it this weekend. But my big question is: what comprises “chili sauce” in Alabama? Here in Hawaii there is a whole aisle in the supermarket dedicated to “chili sauce”, some very sweet and mild, and some that will make your hair fall out. Is your chili sauce sweet or fiery, or just DelMonte (ahem…)? Rusty, the chili sauce Christy is using is basically ketchup with a little horseradish in it. The original is made by Heinz, and in a smaller bottle, about 8 ounces or less. I hope this helps. My husband LOVES Thousand Island…. I’m pinning this for later. It’s similar to my recipe but just a little different and I think this one looks richer. Thanks! I look forward to hearing what you think about it!!! Another delicious recipe which I’m thrilled to have, Christy. It is really good dressing and, oh my, it makes so much we’ll enjoy it for many salads! I a, so glad to hear that you liked it Janel!! !